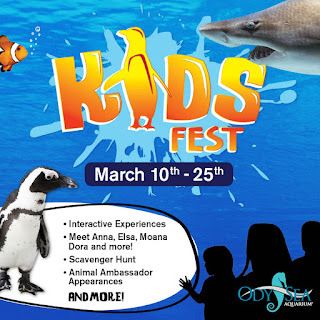 Burning Moon's Inside advice: Kids Fest at the Odysea Aquarium! My family loves to get out of the house so I am constantly on the search for events and activities in our area that are family friendly. At the moment the OdySea Aquarium out in Scottsdale is hosting a Kids Fest event which started on March 10th and runs until March 25th. 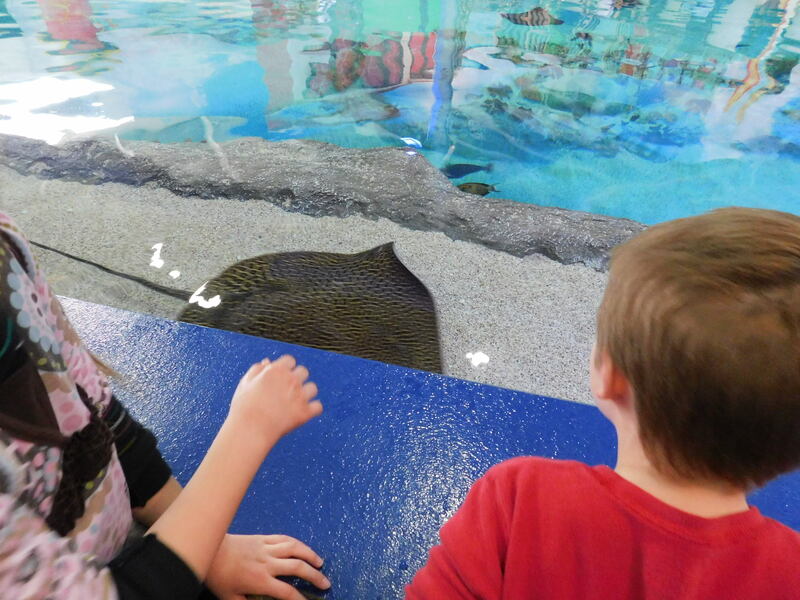 The event is included in the cost of admission into the aquarium (note that Butterfly Wonderland, etc are separate experiences and are not included with the aquarium ticket). My family and I had the chance to go see not only the Kids Fest but the aquarium as well yesterday morning and it was quite a fun experience. 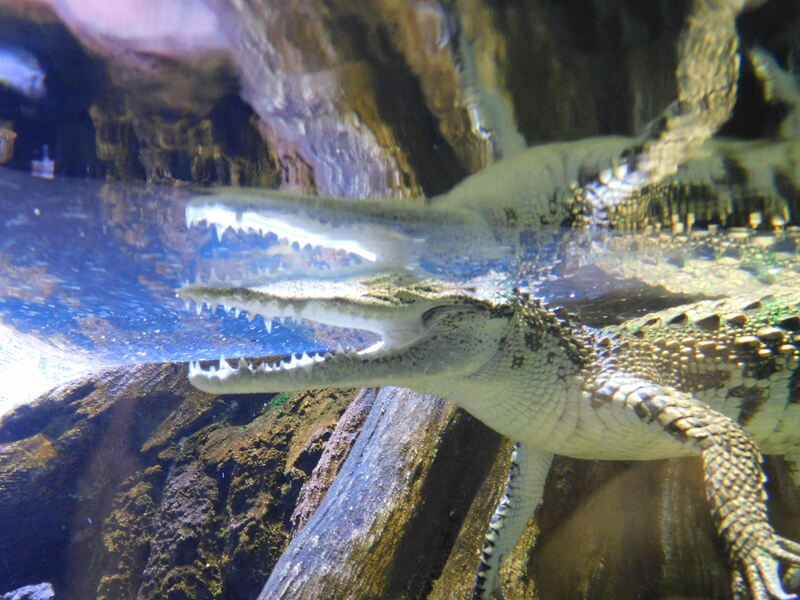 When we went we had a few family members meet up with us that wanted to check out the aquarium as well. 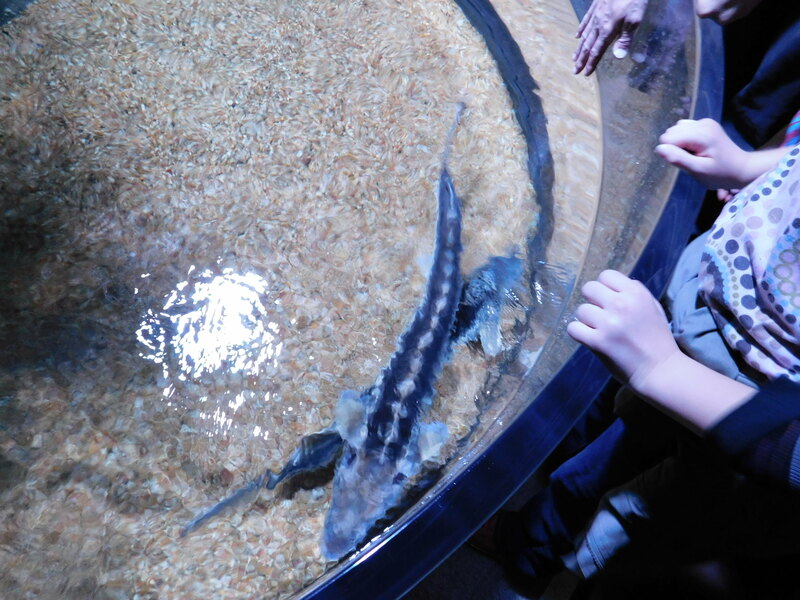 We ran into a tiny problem at the ticket booth but the employees were very helpful and resolved everything quickly so we headed into the aquarium. The kids got a big kick out of the bathrooms when you first come in on the bottom floor because there was a view into the shark tank! (sorry no photos, I was at the ticket booth and didn't know about the sharks until after we left, but the kids went with their grandma to see them). From the time you enter the front lobby of the aquarium until the time you leave there are fish to look at and things to do along with plenty of space to view everything without feeling crowded or uncomfortable. 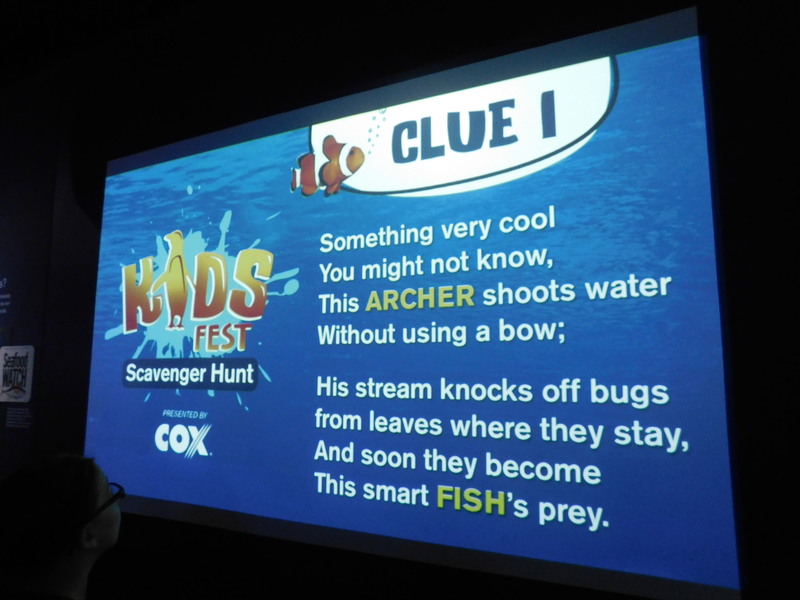 The scavenger hunt for the Kids Fest began in the first aquarium room with clue #1 being shown on a projector screen near the Sturgeon touching tank. Speaking of touching tanks they also had opportunities for the kids to touch other sea creatures as well and they provided both hand sanitizer and hand washing stations. There were other activities as well along the aquarium tour for all the kids to interact with including a big projector showing touch ap games on the floor that the kids could run/walk across to pop bubbles and such. 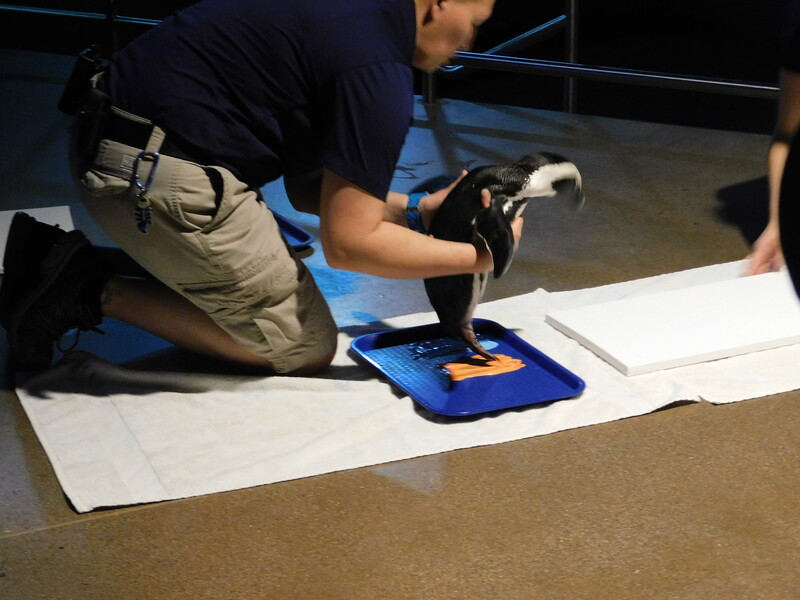 One of the things I was excited about was being able to see a penguin paint a picture! It was very adorable and a unique experience that everyone should try out at least once. They also had Elsa come visit the kids to take photos and do meet and greets. 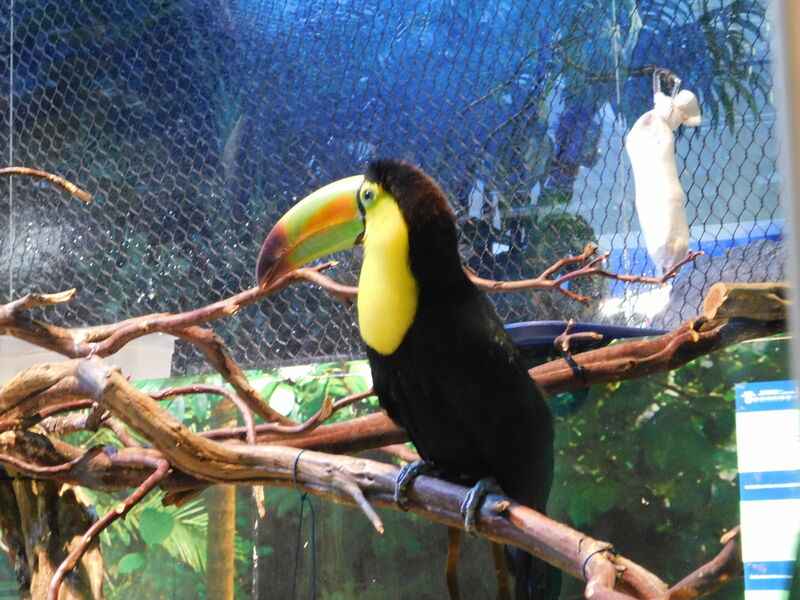 Along with different touching stations and activities they had not only a wide range of wish to see but they also offered bugs, otters, tropical birds and there is a toe-toed sloth (for a limited time as part of their ambassador animal program). We sadly didn't get to see the otters this time as they were all in the back corner of the enclosure but we hope to see them next time. I've already gone over quite a bit, but there couldn't be more could there? Oh yes there is! Everything I just described was on the second floor of the facility, you eventually reach and end point where you have to take an escalator or an elevator back down to the first floor. If you have the escalator you'll be taken through part of a over head tunnel where the fish swim above you. Moving along the tour you'll walk through a second tunnel of fish where you can stop and watch them swim from one side to the other directly above your head. 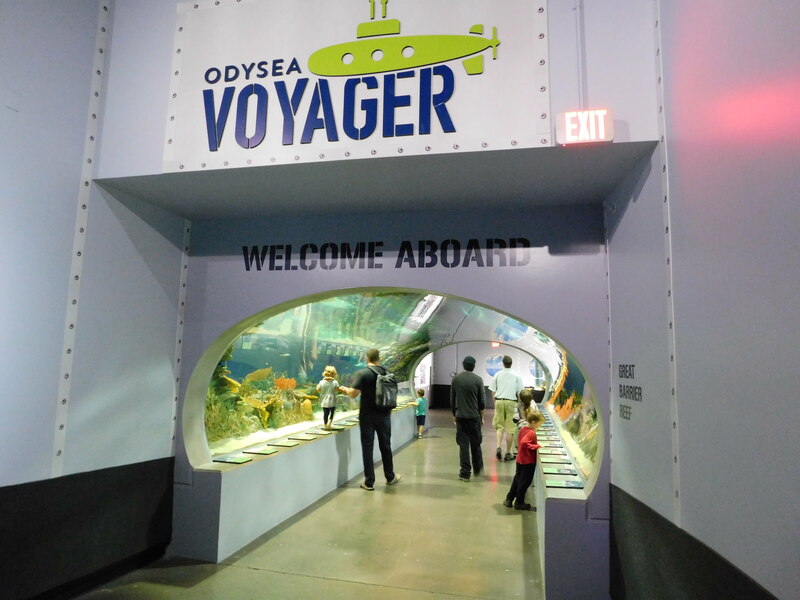 Towards the end of when the aquarium walk through comes to a finish you'll end up at the OdySea Voyager! If it currently is on a sea adventure you'll have to stand in line for a short trip before boarding the ship. What is the OdySea Voyager? It is a neat auditorium room that is stationed on a track and it rotates a full 360 degrees stopping at different "stations" along the way, the entire experience takes about twenty two minutes and you'll see four different aquarium tanks with different sea creatures such as sharks and sea turtles. Following the voyage there will be another short walking distance of tanks before reaching the end where you'll go back up to the second floor and pop out in the gift shop. We were all amazed at how many shops & restaurants were on this property along with all of the experiences offered. 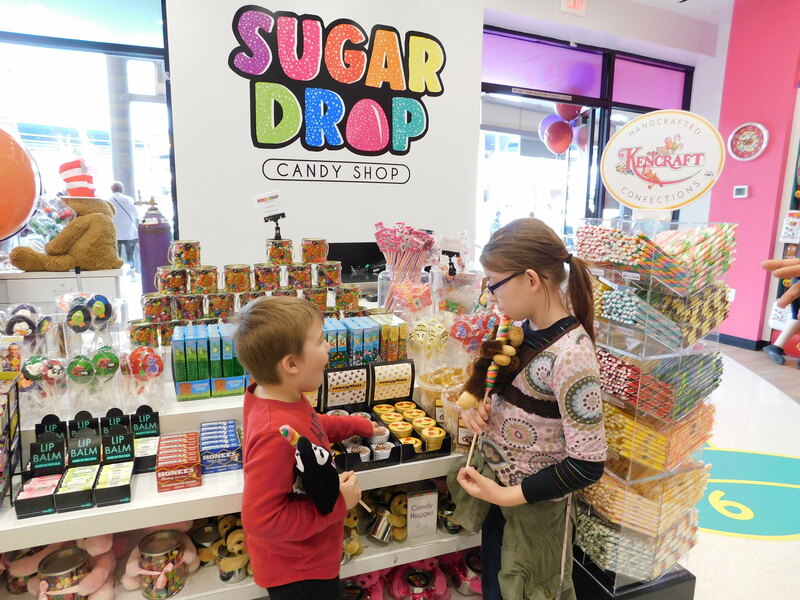 The newest addition to their shopping area is a candy shop called Sugar Drop and they have a lovely selection of sweets and other fun trinkets for purchase, even I saw several things I wanted to get. My kids both ended up picking a large rainbow lollipop with a stuffed animal attached and I grabbed a cow tail and a few circus candy canes. All in all the entire experience was a lot of fun and it wasn't even everything they have to offer there! They also sell tickets for behind the scenes tours of the Shark bay, Penguin feeding/meetings, and more which we hope to check out in the future. If you are in Arizona you should come check out this event and aquarium it is well worth the trip! This looks like an amazing place to visit, I drive by it often and see it from the freeway but have never been and now I really want to. Looks like you all had fun there! It's always good to spend some time out! Such a cool and fun event for the kids! How I wish we have one like that here, so much fun to visit for sure! This looks like so much fun! I love that they had a scavenger hunt set up for the kids! I wish we had this in NY! That looks like fun... I wish we had stuff around us like that!... I too am always on the look out for fun creative new things I can take the kids to go do where they will learn and gain from the experience! We love going to aquariums. This would be so fun to visit! 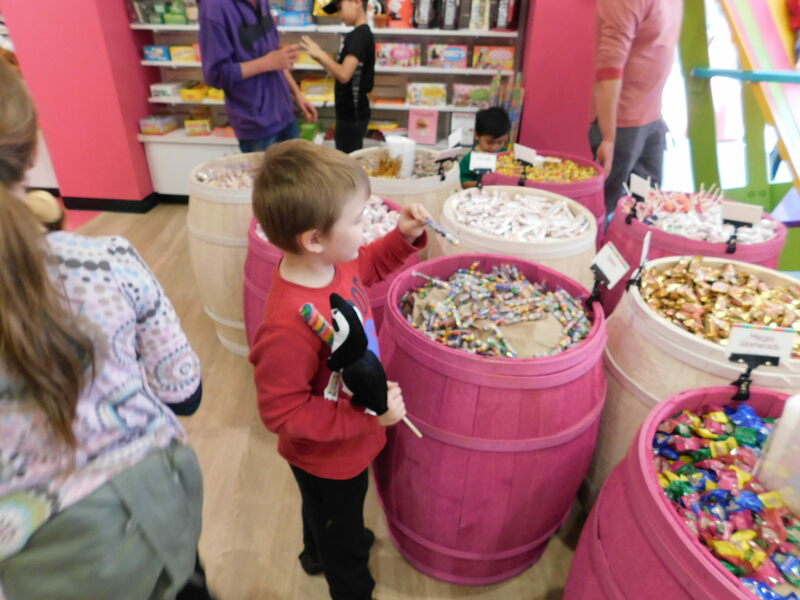 This looks like a lot of fun, I look forward to taking my kids here soon. This would be a nice place to visit! I wish they had one one the area or a nearby city. The one in seattle is similar to this!